Bonang Matheba, (25 June 1987) mononymously known as Bonang, is a South African television personality, occasional actress, Author, radio host and businesswoman. Her career began when she was 15 back in 2002 as the SABC 2's kids' game series, "Manhattan's Fantasy Challenge", however, it would be the 2007 Live auditions that would bring her to the attention of the wider audiences. Since then her career has been a groundbreaking one full of numerous "firsts" including being the first Black South African to feature on the cover of FHM Magazine SA. Bonang was born Bonang Dorothy Matheba on 25 June 1987 in Mafikeng (now Mahikeng) in the North West province of South Africa. She is one of two children to her mother and father, she has an older sister named Nthabiseng. Her mother Charlotte was the Corporate Head of Human Resources at a major agribusiness company, and her father Gampi was a senior lecturer at the University of North West. Her parents divorced and her mother later married Joe Mokoena and had a son, Thabo Mokoena, Bonang's half-brother. The family relocated to Leondale, in the East of Johannesburg. Bonang attended Fourways High School and later attended the University of Johannesburg where she studied a Marketing course but later dropped out due to pressures brought on by the demands of her television work. Bonang began her career on SABC 2 s kids' game series, Manhattan's Fantasy Challenge in 2005. Two years later she auditioned for a presenter role on the SABC 1 music show, Live. Bonang reportedly auditioned for 5 times for the role even traveling city to city across various provinces in pursuit of the opportunity. It was this tenacity together with her talent that eventually convinced the judges. By this time she was also a Marketing student at the University of Johannesburg, after taking on the role of presenter on Live the demands of her job and newly found stardom became too demanding and she left the university. Bonang's success and influence grew in leaps and bounds in the years that followed. Already dubbed South Africa's Number 1 It Girl, in 2009, after numerous rejections by that station she was eventually added to the new line-up of on-air presenters. She had her own weekend afternoon show called, The B* Hive which was well received by the listeners. In 2011 she appeared for the first time on television as an actor in the hit drama series, InterSEXions, where she played Nurse Seipati. Bonang later remarked that he knew her limits, and respected actors and their craft and would not be pursuing a career in acting. During her time on Live she hosted alongside Sizwe Dhlomo and then newcomer Minnie Dlamini who later attained her own success in the entertainment industry. In 2012 Bonang Matheba left Live after 5 years on that show and was replaced Luthando Shosha and Pearl Thusi alongside DJ Warras. In December 2012 Bonang joined SABC 3's long running magazine lifestyle show, Top Billing as one of the presenters. In 2013 she began hosting the South African version of Clash of the Choirs and after two seasons she was replace by Lawrence Maleka. In 2015 she hosted SABC 3's Afternoon Express express alongside Bonnie Mbuli, Jeannie D and later Danilo Acquisto. In July 2017 her own reality show, Being Bonang went on air on VUZU AMP. She has also hosted a number of awards ceremonies including The Metro FM Music Awards, The MTV Africa Music Awards, The South African Film and Television Awards and The South African Music Awards. 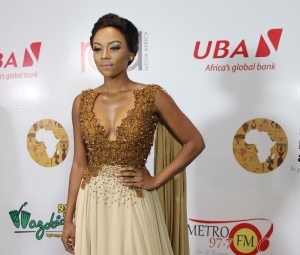 Bonang also hosted Miss South Africa, Tropika Island of Treasure and The Search: E! Host South Africa. In the course of her career Bonang has feature in numerous campaigns and magazine covers including; Woolworths South Africa lingerie line, being Ambassador for Ciroc Vodka in Africa, being the first ambassador outside of the USA for Revlon, being African Brand Ambassador for Ipanema sandals and signing an endorsement deal Cell C.
Bonang was the first Black South African to feature on the cover of FHM Magazine SA (2011), the first South African star to cover Cleo Magazine SA (2011, the first Black South African to cover Glamour Magazine SA (2014), the first South African to host the MTV EMA’s red carpet (2014) and the first South African to get their own E! News Special in Africa (2015). Bonang authored an autobiography titled Bonang: From A to B which was released to unrestricted rebuke, condemnation and mockery. The book became a talking point on social media after users pointed out that Bonang's birthday was published as 24 June, when it is 25 June. Much of the criticism pointed out grammatical and factual errors. However, in the ensuing mockery and rebuke, the publisher of BlackBird Books Thabiso Mahlape, said she took responsibility for the errors. "I take full responsibility for what happened. The last thing I want is for black people to be accused of mediocrity and I should do better. It's on me as the publisher. I ought to have done better. It was my mistake. I wrote that line and it went through all the various processes and no one caught it...it happens," Thabiso Mahlape said. While Bonang was quoted by TshisaLIVE saying, "We will be the sacrificial lambs. We will take the rubbish so that those (black girls') that come after us don't have to". The book was removed from the store shelves, corrected and later re-released to a much tamed reaction. The relaunched version following the recall included to notable omissions, those of Bonang's former best friend Somizi Mhlongo and ex-boyfriend Euphonik.It is understood that this was due to legal letters sent demanding that their names and any references to them in the book be removed. "As daunting as the process was, it taught me that sometimes things do fall through the cracks, and I felt it was a lesson that could not only be learned by me, but also by those that are to come after me. I truly am grateful to my fans for the love and continued support that they have shown me through it all – and continue to be by my side," Bonang said at the relaunch. Early on, perhaps even before Live fame, Bonang dated Slikour, a South African rapper known for his days as the member of the rap super group Skwatta Kamp. In 2016 after having been in a high profile tumultuous relationship with DJ Euphonik and while in a relationship with famed rapper AKA, Bonang remarked in an interview (with Slikour) that Slikour was her best boyfriend. “There is so much that you have done for me personally and in terms of my career. There is a lot of things people don’t know about us,” she said. “Until this day I will never speak ill of you. I will never say anything negative about you because you have never been an a**hole towards me. He was 50% responsible for my Legit deal. He put all that together for me. I know how a man is supposed to treat a woman because of you,” Bonang in an interview. “I’ll tell you why I never made a comment on it, because they are both people I love. The one says this and the other says that, what do I say?I’ve always made it clear, my friends know how I feel about woman abuse and he swore to me that he never beat her up.She said he did. In fact, for me, that’s why I’d hoped that it had gone to court so that it gets to breathe there and hopefully, the truth comes out, because the truth lies somewhere between the two of them" DJ Fresh said a caller on his Metro FM breakfast show. Bonang was in a relationship with South African rapper AKA. The rumour had endured until then AKA's girlfriend DJ Zinhle accused the pair of having an affair behind her back. It was not long before the pair confirmed they relationship. This led to numerous subtle feuds including that between Bonang and Pearl Thusi. In the months that followed the Bonang and AKA flaunted their relationship for all to see including red carpet appearance and even doing a YOU magazine interview together. The pair's relationship eventually fell apart and this paved the way for public bitterness that followed. AKA criticised in his song, Beyoncé, while Bonang claimed that she missed nothing about him. "I miss nothing, or I don't know, maybe he was funny, I guess - that's it", Bonang said in a Drum magazine interview. This page was last edited on 30 January 2019, at 20:00.